Our son has joined us for some great trips in his short tenure, but tomorrow, he goes international for the first time. We took him to get his passport when he was six months old and he is full on beaming for that camera. We love that he will keep that photo for the next decade so when he is eight, he can enjoy his "Mr. McGoo" passport photo. 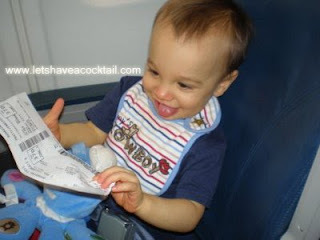 What will also be in interesting twist of fate is just how much our two year old enjoys a five hour plane ride. Let me share what occurred last time. First, as with many other trips, you instantly gauge who are friends or foes of children the minute you enter a plane with one. Eyes either light up or they roll. There seems to be very little in between. We love sitting by the grandparents. And you can tell grandparents the minute you see them. Eyes lock, secret society looks are exchanged. Prior to having our son, I wouldn't have noticed a grandparent unless it was holding that child singing "I AM YOUR GRANDMA". But now, the grandparents are an instant fan club for us every time we travel. And since our son is super chatty, and super flirty with the ladies, he very quickly establishes the retinue of a small potentate. And by the way, Eye Rollers? Stop it. Don't roll your eyes when you see a baby. You cried, threw tantrums, and wet yourself once too. And maybe you weren't you a baby the last time you did. Oh you don't like babies? So what. Many people share your sentiments. However, I don't like onions yet I am able to contain myself when I see them at Whole Foods. Oh, but onions don't make a big racket? Especially on an enclosed airplane? Oh, I feel you, I really do. However, don't assume I am the mom who lets her child run rampant, stand up on the seat and pull your hair, throw his water bottle at you, scream Itsy Bitsy Spider at the top of his lungs, or kick your seat. He won't because we don't let him. And if he does cry? So what. He will stop. We don't enjoy it to any greater degree than you do. You don't have to come to his next birthday party, just try to calm down when you see that we may be sitting a few rows from you as if this is the LAST THING you need. Wait until he does something to agitate you before you get agitated. Oh, and when you get agitated, and say something snarky? Those grandparents I mentioned are going to not only silence you with a look perfected with 50 or 60 years of life, but that look might make you wet yourself a bit. Or at least be afraid to get out of line again. Watch yourself. Back in the day, these people were whipping disobedient children. I am sure, just like Fonzie, they still got it. I have became rather adept at changing diapers in a airplane bathroom without touching a single thing in there. JohnnyMac's brother worked for one of the biggest airlines in the world for ten years and told us they don't actually clean the bathroom in between trips. E Coli? Not today, thanks. But as our son has gotten older, his hand eye coordination is over-developing. And our trips to the tiny can involve a great deal of me playing Mr. Miyagi to his Danielsan. Wax on, wax off, wax on, wax off. And since that is only fun for about three minutes, I make those lav trips on this side if "highly quick". I saw a woman traveling once with one baby and so many bags, baubles, and blankets I thought for sure her spine would snap. And, all for one baby mind you. Now, moms know their own children best, as well as the trigger points, but I have seen very calm and cool Mommys traveling with one tiny bag and a perfectly satisfied little one. So I am taking that path and refuse to juggle an endless array of potential "attention distractors" hence I look like Geoffrey from Toys R Us. So changing diapers and over-packing aren't the issue. We put a modest amount of toys/books in our aerodynamic flight bag and get on the plane. But this is how he gives us a run for the money. First, he refuses to be out of Daddy's eyesight for more than three seconds. Easy. We can win that battle. Then he must have some Cheerios. That's all? I will see your cheerios and raise you some. But then, he doesn't exactly want to sit in his seat. Hmmm, that will prove to be more challenging. And it got just a touch ugly. And by "a touch" I mean, I looked at my watch when his fitfulness began. I looked at it about 2 hours later and realized hmmm, actually, only 14 minutes had passed. How silly of me not to recall that toddler time is the reverse of warp time but only when things are going South. And then he wanted the cheerios that fell on the floor. Nothing spells delicious better than food that has touched the floor of an airplane. Thankfully, our son got his eyes on the woman across the aisle and he spent an hour staring at her. He does love the ladies. Wonderful. With this female distraction (and she was a very congenial person to play along), a few snacks and holding Daddy's headphones while listening to We Will Rock You, we made it. That is only the beginning of him losing track of all kinds of time due to mesmerization by a woman. Daddy will confer. And I will be posting from south of the border so tune in.